If you were crewing for me at a run, I would send you my Crew Document. Yes, I send this to you ahead of time, and also print a copy (along with the pace chart) and have it waiting for you in a folder with the crewing stuff. This is a the “Bible” of crewing the running Mel. Along with race specific information in the beginning (which you can see in the screenshot), the remainder of the document is crewing advice and needs based on experience and past crew input. The remainder of the post is heavily based on the text of this document. Feel free to copy and use anything here that you think might work for you! ***Many thanks to Aurora for her feedback and many suggestions over the last couple seasons that resulted in this system. I swear Aurora has crewed for me enough times she can basically read my mind…but as other friends offer crewing help (Crysta, Ashley), I realized that writing it down might be more efficient. After crewing for Tahoe, Crysta kindly reviewed and updated it. I look forward to future crews’ input in the document. You will have the following items. 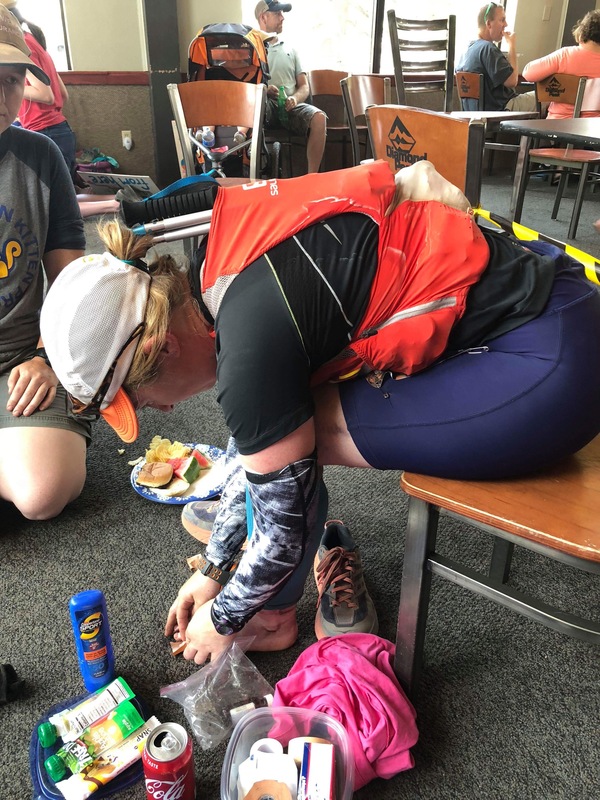 Please bring with you to the aid stations and don’t leave in the truck, unless you can retrieve something from the bag in under 30 seconds if it’s needed. 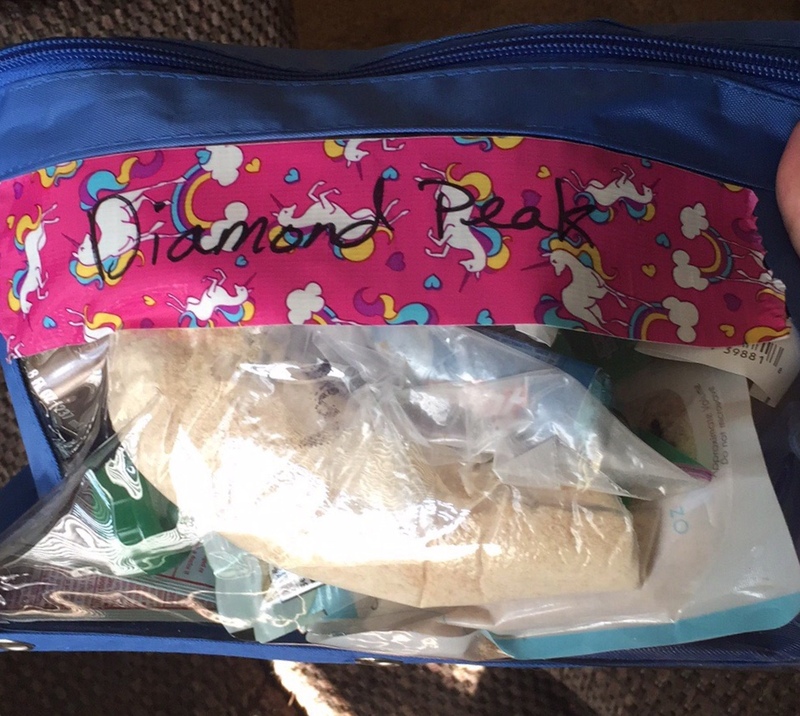 The backpack gear will be separated into ziplocks of related items.T his will make it easy to find what I need quickly. 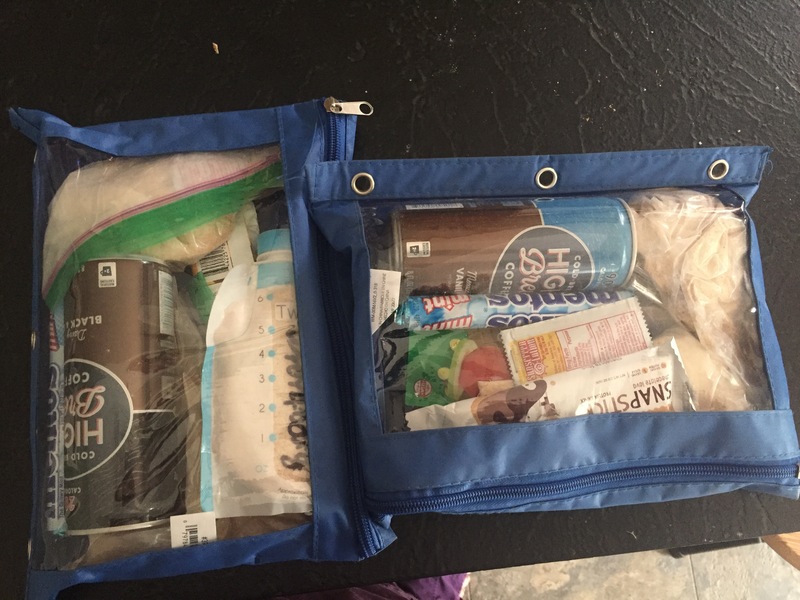 For example, one ziplock will have all the clothing items, another will have food. There is a tupperware container that contains everything needed to fix blisters and hotspots. Items that I will only need in an emergency (extra contacts, glasses) are in the front pocket of the backpack. 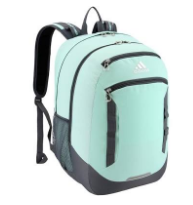 Not my backpack pictured, but the one I have is simple and unimaginative. Nothing special. Feed back from crew has been that they prefer a backpack to crew out of than a bag that has to be carried. Has a set of warm dry clothes, baby wipes, and comfy shoes. This bag does not need to be taken to the checks and can either be staged at the finish line ahead of time. 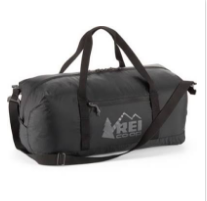 Close to what my duffel is….but again, not my duffel pictured. An actual drop bag. I also use shoe boxes or soft sided cheap lunch boxes or gallon sized ziplocks, depending on the race. I do not use containers or bags that I care about getting back at the end of the race *just in case*. I usually send drop bags even if I have a crew so that if something happens I have the bare essentials I need to finish the race. Here are some more pictures of what I include in a typical drop bag. 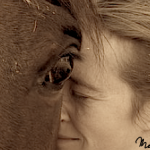 Ask what I need – I usually have a check list in my head as I come into the aid station of things I need to accomplish. If the aid station is serving hot foot I WILL WANT SOME. YUM! Give me my options when I come in, and “order” it right away. Sometimes the volunteers need a couple of minutes to make the food. Ask how many minutes I plan on spending. Usually the answer is somewhere between 3-10 minutes. KEEP TRACK OF THIS TIME, and give me a 1-minute warning when I need to head out. Unless we are trouble shooting something really important, don’t let time slip away at the aid station. Ask about hot spots – NOW is the time to get those resolved before they become a larger problem. Get me commit to fixing them (taping, new socks, probably same shoes) either at that aid station or the next. I usually do an all in-all out for my pack at my aid stations. This means I dump EVERYTHING out of my pack whether I ate it or not, and replace it with the contents of the food in the drop bag. Sometimes I will make quick substitutions depending on what is working for me that day. I usually take a little sandwich bag of food away from the aid station to munch on. I forget to cool early enough and often enough. If the sun is up, then I should be asking for ice down my bra and in my hat. Sponge down arms, back of neck, face. REFILL water bottles bottles – check the caps aren’t cross threaded. Blister kit is out of the backpack and I’m taping a toe at an aidstation. Crew person has also set out the clothing ziplock with a shirt in case I wanted a dry shirt (I didn’t), and the sunscreen has been set in a prominent spot. After taping the toe, crew had to actually physically put the sunscreen in my hand for me to remember to put it. Another crew member has a plate of hot food on the other side of me. A good way to judge how I’m doing is whether I’m bubbly and talking. Even if I’m excitedly telling you how crazy the last section is that’s better than being silent. Silent is what I do when I’m struggling. Chairs aren’t a problem for me. Encourage me to sit if it’s in the second half of the race. I don’t usually change shoes during the race. Rarely I will change socks. If I do a planned shoe/sock change during a 100 mile race it’s usually between 75-80 miles. About half way through the race, give me a new ziplock bag for my snacks I carry in my vest. There are extras in the backpack. The powdery stuff in a bag with my food supplies is perpectuem. It’s usually labeled with a number or a number and a “+”. The number represents “scoops” (usually 2-3) and the “+” tells me if it’s a variety that has caffeine in it. Perpectuem is my go to if I’m having issues eating enough calories. Starting in the afternoon I usually carry a baggie of it with me in the back of my vest to put in a water bottle if I need it. Sometimes I ask you to mix it into a bottle. If so, fill the bottle half way with water, dump the bag in, shake to mix, fill the bottle the rest of the way with water. Some of the powder will spill. It’s OK. If I have you mix a bottle for me, sometimes I will leave the aid station with 2 water bottles and a third perpectuem, sometimes 1 water and 1 perpectuem. Ask me what I want. I’m wearing contacts. My glasses are in the backpack if I need them because a contact fell out or whatever. My headlights take AAA batteries. I need to be carrying AT LEAST 1 spare set (3 batteries) with me on the trail. At night, exchange my batteries. My hand held light (if I’m using) takes 123 batteries. I should carry one spare. There are spare headlights available in the backpack. My secret weapon if I don’t want to eat is mentos. I should be carrying a stick for most of the race. In the afternoon I should have a baggie of candied ginger. The food I can usually eat no matter what is applesauce packets. My GPS battery lasts 18 hours. I have 2 so you shouldn’t have to recharge in the middle of the race. However, if something happens and it needs to be charged, the charger (portable with cord) will be in backpack. Not wearing sunglasses when I need to. Depends on the race. If I’ve told you I need them in the afternoon, give them to me. Take them from me in the evening. Don’t let me leave the aid station without refilling water. I forget sometimes. Not taking an extra layer with me when the sun goes down. Crew members have told me that including this information in the crew document is extremely helpful. Two water bottles in the front. If there’s a third bottle, it’s handheld or in the back lower pocket. Poles are in a loop system on the back of the vest. Food is stuffed in the lower front pockets. Anything that doesn’t fit goes in lower back pocket. 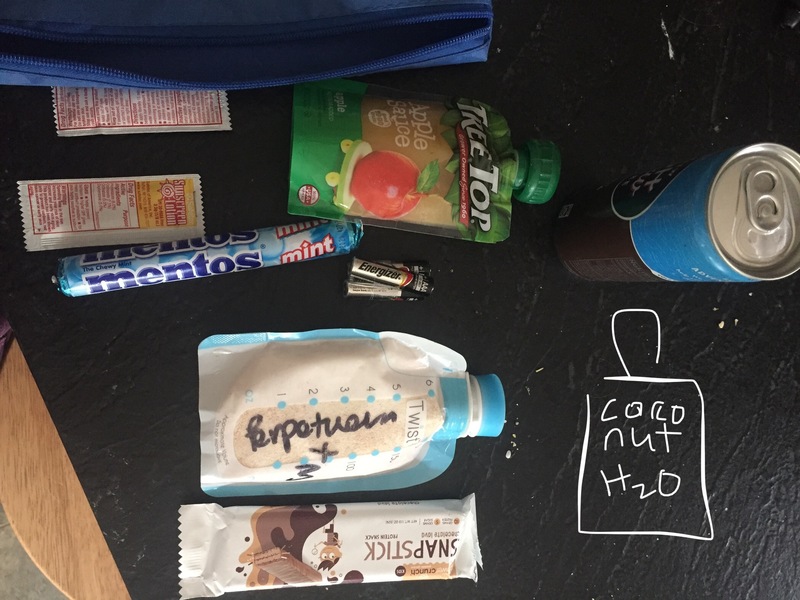 Elyte tabs are in small plastic container container in top (left) elastic pocket along with a small container of squirrels nut butter (anti chafe cream). Batteries and lights are in left side zippered pocket. I’ll try to put used batteries on the right, usually in a small ziplock. In general, batteries that are taped together in bundles of three are new, loose batteries are used. Phone/ipod/ear buds are in the right upper zippered pocket. A section added by Crew Crysta. I love that crew is passing on lessons learned to future crews. 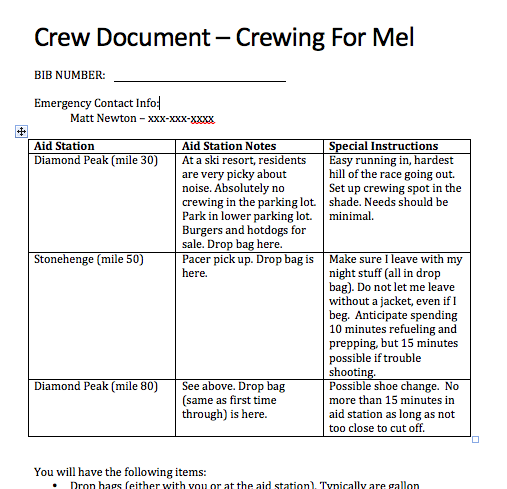 Crew Crysta decided to update my crew document with some summary points from my bonk post. Could be useful! This section used to be simply the link included down below and a note that you don’t *have* to help me with my feet if you don’t want to. Crysta decided to summarize what’s in my blister kit, and summarize some “taping philosophy” from the linked website. It got me thinking…what if that website goes away? I better take a couple of screen shots just in case…. I carry benzoin for cleaning the skin and making the tape stick better, and Leuko tape and a small pair of scissors. If my feet are really dirty, I need to wipe off the dirt before the benzoin and tape will stick. I’m mostly likely to blister a little toe, or the inside part of my forefoot on the side, kinda close to my big toe. Sometimes the back of my foot (like where the Achilles is) gets really irritated and has to be taped to try and reduce friction. Clean the area around the blister. If lubricant has been used, this can be tricky to remove completely. Using alcohol can help; I’d recommend using plenty of rubbing alcohol as it’s cheap and a good solvent. Be aware of the passage of time during a race, as it’s possible to burn through enough time that meeting the cut offs becomes difficult. Avoid duct tape – it’s macho, but a poor solution. This is a document/concept that’s always evolving, so consider this the “July 2018” edition. 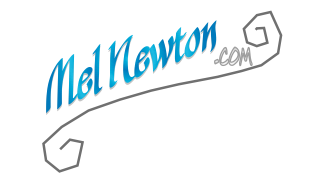 If you are reading this post in the distant future, feel free to leave a comment or send me a message to ask me what has changed since this point! It’s really lovely to have the support that is described here for a big race, like a 100k or a 100 miler. Sure, I could probably get through (most) races without this level of support. But having a crew really does help me have more fun, take care of myself better, and be a little faster. I’m so grateful when a friend offers to crew – I treat it like a huge gift.